I've found I now have a better sense of the cultural and historical context of New Orleans than I do Los Angeles, where I've lived and gone to school for two years. Bookpacking the Big Easy has inspired me to bookpack the world, starting in my own backyard. I know that the experience doesn't end here; I don't think I'll ever travel and explore the same way again. I'll echo what I said at the outset of this trip: if everyone travelled with a book in their hand – a true book that speaks with the voice of a place and a people – then I think we’d all be much better at the art of understanding. My time in New Orleans, with the other student Bookpackers and Andrew, has only strengthened my belief in this statement. I think the positive influence this experience has had on my life is encapsulated in that day at the fiddle store with our new musician friends. Thanks to Bookpacking, I got to read an honest and beautiful little story about a people (the Cajun community in “Floyd’s Girl”), and then I was given the opportunity to learn about and from members of this community. So I did. I was given the opportunity to reciprocate the love they gave to me. So I did. And that's pretty awesome. Thank you to my Bookpacking family for making this adventure as amazing as it was. Thank you to USC Dornsife and the man, the myth, the legend Andrew Chater for...well...everything?Thank you to the beignets for rocking my world on a daily basis. Lastly, thank you to the gators that didn’t show their faces because it’s #nestingseason. Joke’s on you, I got a picture of your cousins at the Audubon Zoo. Just because they’re captive gators doesn’t mean it’s cheating. That’s what I’m telling myself. Crikey! Lastly, I'd like to thank the Academy. So cool, so cool, so cool. That is really all I have to say about our two major events in Cajun Country (around Lafayette): meeting Dr. Ernest J. Gaines and spending time with bluegrass musicians at Tom’s Fiddle and Bow Shop. Just kidding. I have way more to say. First of all, I am so grateful Dr. Gaines and his family, not only for allowing us into his home in Pointe Coupee, but also for answering our questions and giving us oatmeal cookies. Mrs. Gaines makes a mean oatmeal cookie. And Dr. Gaines was so open and wise when I started asking questions about God and jazz. God and jazz: the pretentious question starter-pack. So thanks for being patient, Dr. Gaines! A Lesson Before Dying is the first book in a while that made me lock myself in the bathroom after finishing it. I sat on the sink in the Baton Rouge hotel room Olivia and I were sharing and just had a good, long, somber think. My Sink Thinks only happen when something has profoundly affected me. And A Lesson Before Dying did just that. It is an astonishingly poignant novel about a black man, sentenced to be executed for a crime he didn’t commit, trying to reclaim his human dignity before he dies (with the help of a very good friend and teacher). Throughout my reading of the story, I was reminded of one of my favorite poems – “Invictus” by William Ernest Henley. We visited the courthouse in Lafayette that Gaines was thinking of while writing the book. We wandered through the cells, which now serve as storage units for the sheriff’s office. But some are still empty, and I was able to walk in, shut the barred door behind me, and try to imagine what Jefferson (our doomed hero) undoubtedly feels sitting in his small, humid cage. And I just kept thinking of those immortal last two lines of “Invictus”: I am the master of my fate, I am the captain of my soul. So often, we are all wretched like Grant, Jefferson’s teacher – unable to stand with courage as a human being and unable to genuflect before any god. But I like to believe that, at the end of his life, Jefferson does both somehow. He bridges the gap between human dignity and sublime submission with elegance and courage. “Tell Nannan [his godmother] I walked,” he utters before submitting to death. He is certainly the captain of his soul. Standing in that rusty cell in Lafayette, I could just feel it. The day after visiting Dr. Gaines, we headed to Tom’s Fiddle and Bow Shop. 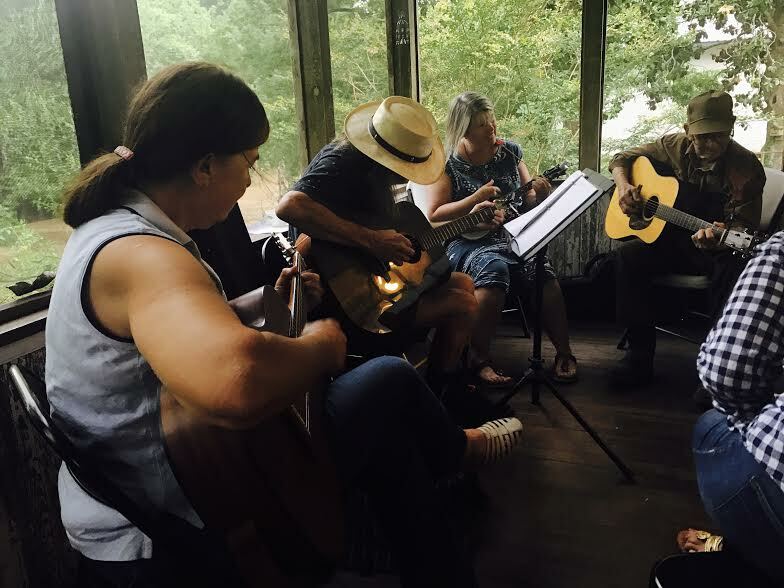 We had just finished reading Tim Gautreaux’s short story “Floyd’s Girl” about a strong Cajun family, so I was ready to listen to some authentic Cajun and bluegrass music and meet some authentic Cajun people. But, holy guacamole, I did not expect to fall absolutely in love with these people. I spent the majority of the three hours at Tom’s on the back porch that overlooked the calm, brown bayou. Leland, Lori, Janet, and Elmer were playing out there, and singing “Ring of Fire” and “House of the Rising Sun” with them made me so inexplicably happy. I had never before sat among strangers and realized how completely beautiful they were. Really guys, I was grinning like an idiot the whole time. It’s because people like Leland, Lori, Janet, and Elmer (and Byron, who was in another room, but who told me he loved my glasses – you’re a legend, Byron), people that don’t know a lick about you but open their arms wide and invite you to sing along…they are the reason I know the human race is worth saving. No exaggeration. Jambalaya is delicious (like everything else in this state), and it is also the perfect Meal of the Moment, since the event we attended at Tom’s Fiddle and Bow is called “JAMbalaya” and it happens the first Sunday of each month. I don’t know what else to say about the roux-based rice and meat dish, except that I ate it at a restaurant where I taught Stasi how to dance to bluegrass. 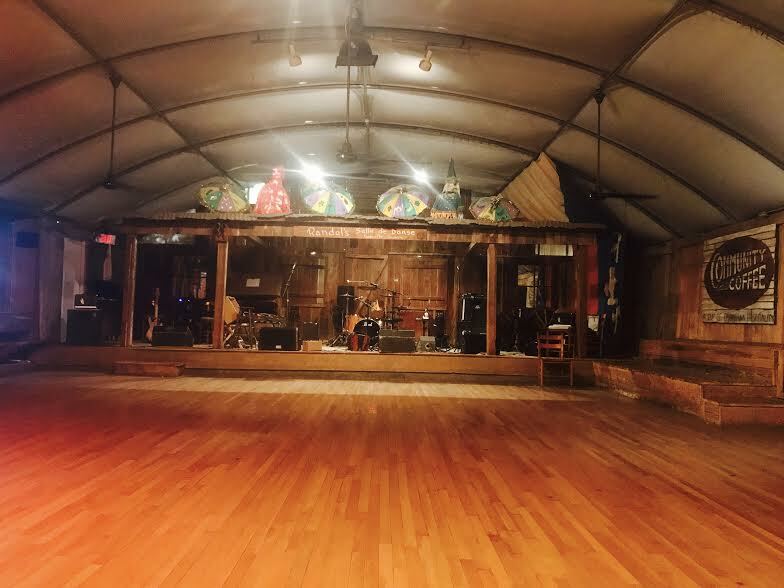 It was a lot of fun, but twirling around a dancefloor after eating jambalaya was a precarious situation. Jazz is something with which I am familiar, having been a part of my high school jazz ensemble. I played the trumpet (which, obviously, makes me part of the coolest section in the band). I knew coming down to New Orleans would be like a jazz nerd Comicon. Needless to say, I was excited. And NOLA has not disappointed. Jazz, in so many ways, is the essence of the city; its heart and soul; the thing that drives its rhythm. Originated in the brothel houses of Storyville, influenced by West African musical traditions, and brought into the mid-20th century by such greats as Louis Armstrong, jazz tells the tale of the African-American experience. I'll talk more about Dr. Gaines in Cajun country, but what I will say now about the time we all shared with the A Lesson Before Dying author in his home was that he emphasized jazz's influence on his writing. At the time he began penning his works, there were essentially no books by black authors about being black in America. There was only jazz. The blues tell of the woe and hardships in life, of loves lost, of people who have done you wrong, of a rainy day when you were expecting sunshine. Most importantly, the blues tell of an oppression as old as the country itself. In a brief digression, below are pictures taken at the Whitney Plantation on the historic River Road. 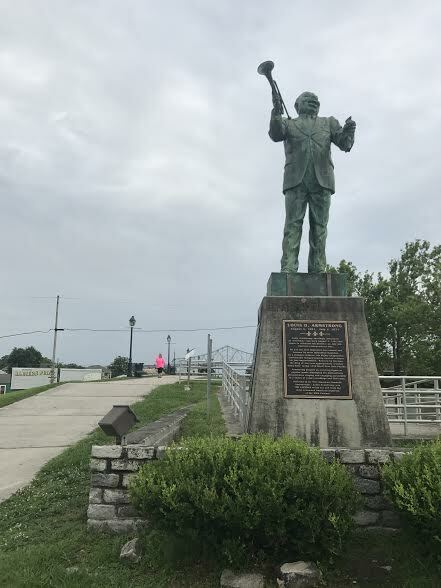 Unlike most other plantation tours you can go on today, the Whitney tells of plantation life from the perspective of the slaves that worked the fields of sugarcane in the sweltering Louisiana heat, day in and day out. Being shown around by our unbelievable tour guide Ali was an experience I will never forget. And if you want to understand the origins of the blues – you need look no further than places like the Whitney. To listen to the wind blowing through the stalks of sugarcane, to listen to the eaves creaking in the slave quarter houses, is to hear the Christian spirituals and West African traditional songs that would eventually give birth to the art form of jazz. But Jazz is joyous too. It pulsates at the city's core and serves as the soundtrack to all the raucous, rowdy goings-on in places like Bourbon Street. Ah, Bourbon Street. My least favorite part of NOLA – but only because, like Times Square in New York City and Fisherman's Wharf in San Francisco, it's a bit of a tourist trap. But, nonetheless, when one thinks of the New Orleans party scene, one usually thinks of Bourbon. Like the old jazz cats that play in front of shops and cafes and the young children who bang on overturned buckets-turned-drums, Bourbon Street is always vibing. People stand out on balconies overlooking the gaiety down below – men and women in work clothes, having just gotten off, hanging out with friends, watching the street performers and eager tourists hop from bar to bar, bistro to bistro. There are all kinds of characters here and I now fully understand Louis's apt description of this city in Interview with the Vampire. These are also the very same people Ignatius J. Reilly labels as “gamblers, prostitutes, exhibitionists, Antichrists, alcoholics, sodomites, drug addicts, fetishists, onanists, pornographers, frauds, jades, litterbugs, and lesbians” in John Kennedy Toole’s comedic masterpiece A Confederacy of Dunces…and that’s just on page 3. While I don’t exactly share Ignatius’s harsh opinions about the city of New Orleans, I can still see how a man such as himself would view this vibrant, sensual world as a black pit of corruption. I’ve discovered that New Orleans is truly the best place to bookpack. Here, more than any other place I’ve visited, that “good eeriness” comes alive. Walking through the French Quarter around Jackson Square, it seems entirely possible you’ll find Ignatius at his hot dog stand, leering at the passers-by. Exploring the Garden District at night, it seems entirely possible Louis and Claudia (of IWTV) could meet you under a lonely street lamp, the Spanish moss above you blowing somberly in the breeze. Okay, so beignets aren’t technically a meal. More like a sweet snack/dessert. But whatever, okay? They’re powdery and warm and delicious and I ate three for dinner one night, so they’re a meal in my eyes. The best place to get them is Café Du Monde. Don’t let anyone tell you otherwise. The place is world-famous for a reason. Despite what you may think, this variation of beignet is original to NOLA, not France. In fact, though the city is heavily influenced by French culture, there are a great many aspects of fair New Orleans that might seem “French” but are more like “NOLA French.” Upon closer examination, some of the “French” street names are misspelled, and the local slogan “laissez le bon temps rouler” (which is supposed to mean “let the good times roll”) actually makes no sense in French. One of the things that surprised me most about NOLA (New Orleans, Louisiana) was how significantly religion and spirituality permeate the culture. The iconography of Catholicism can be seen everywhere, from the steeple of St. Louis Cathedral to small, plastic busts of the Virgin Mary sold in French Quarter gift shops. I, personally, was looking for a dashboard Jesus, because I have to drive my mother’s beat-up minivan to work when I get home. I need Dashboard Jesus. Evidently, no one is selling Dashboard Jesus. Taken from Jackson Square, in the heart of the French Quarter. Louis XV sent the nuns to Louisiana in 1727. New Orleans, it seemed, needed saving. Catholicism is a religion rooted in vivid images and strong symbolism; namely, the sacrament of the Eucharist. When you drink the wine, you are literally drinking the blood of Christ. When you eat the wafer of unleavened bread, you are literally eating the body of Christ. Anne Rice capitalizes on the richness of a Catholic relationship with God to create an unsettling, supernatural world - a world where a young man’s brother claims God speaks directly to him; a world where the death of this brother elicits such grief and guilt that the young man dies into a life of damnation. This, of course, is Louis’s story in Interview with the Vampire. — Anne Rice, "Interview with the Vampire"
Yet, voodoo traditions still manage to share New Orleans with the Catholic Church. Voodoo dolls and beads are often sold at the very same gift shops that charge $7.99 for your plastic Virgin. At St. Louis Cemetery, a predominantly French Catholic burial ground, the most visited grave is that of renowned Voodoo Queen Marie Laveau. 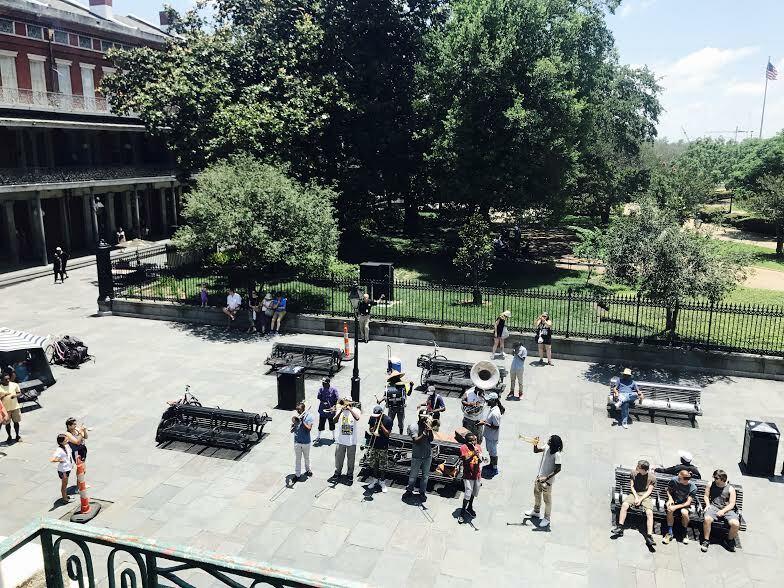 But while the mingling of these traditions creates the fascinating character of the city we see today, it also indicates a dark blemish on NOLA’s history. The French brought Catholicism here with the nuns of the Ursuline Convent. The West Africans brought voodoo here on slave ships. Much of Louisiana, as we’ll come to find at the Whitney Plantation, was built on the backs of slaves. Just as voodoo/hoodoo intertwines with Catholicism, life and death seem to shake hands here. When we visited Lafayette Cemetery in the Garden District, the sky was gray and ominous. A gentle breeze made the tree branches rattle like skeleton bones. Somewhere off in the distance, a church bell tolled somberly. And all around, the above-ground graves were marked by decay and overgrowth. Little vampire Claudia chooses this place to hunt her victims at one point in the book, which I find quite poetic. She, herself, is the epitome of death in life, and vice versa. A child who can never die, but cannot be considered truly alive, either. — "Interview with the Vampire"
In New Orleans, being alive among the dead is inescapable. After all, 250-year-old corpses lie, not six feet beneath the ground but, rather, in a crumbling mausoleum right beside you. But I feel as though this place has a particular gift for embracing it, rather than letting death ruin its vibe. Mardi Gras beads hang from weeping angel statues and, indeed, the famed jazz funerals here are perfect representations of joy and celebration, despite the sorrow that comes with death. Next time, we’ll be exploring that more joyous side of NOLA – the music, the partying, the beignets (!!!) – and meeting Ignatius J. Reilly of A Confederacy of Dunces, who thinks the city is home to the absolute scum of humanity. It’s going to be a blast. Fried catfish makes my heart sing. If you are ever in NOLA, swing by Ray’s on the Ave and get the $5 Friday special – it’s fried catfish with potato salad and sweet peas. You will never have any reason to be sad ever again. Fried catfish was my introduction to southern fried food, and what a fantastic first fried food (quadruple alliteration there) it was. It’s also amazing in a Poboy which, if you’re unaware, is a big sandwich with pickles, mayo, tomato (if you want it, which I don’t), and your choice of meat. It’s suh good. But Morgan, you ask, why is your Meal of the Moment for “NOLA: Spirituality” fried catfish? Is there a significance? No. No, there is not. I considered making this Meal of the Moment the actual Eucharist but I’m 97% positive that’s #sacrilegious. So...catfish. En route to New Orleans, we stopped over at the Barataria Preserve in the Jean Lafitte National Historical Park. We were on a mission – spot the elusive American alligator in its natural habitat. Well, I suppose it was mainly my mission, and I forced everyone to become as enthused as I was. I worked at a zoo for five years so, naturally, it's my duty to throw around words like osteoderms, death roll, and Steve Irwin’s signature crikey! Rest in Peace, Steve. Unfortunately, however, we saw no gators that day. And, truth be told, the bayou trees were slightly underwhelming, since all the largest cypresses were cut down about a hundred years ago (humans ruin everything). But there is hope, yet – Andrew promises we’ll take a swamp tour when we head west into Cajun country. I’m going to hold him to that. But, lack of gators aside, venturing into the mini-bayou was the perfect transition from Grand Isle to New Orleans. It created the ambience necessary for reading Anne Rice’s Interview with the Vampire. Stepping into a Louisiana swamp is like stepping through time. Prehistoric-looking ferns brush your arm as you labor through the stickiness of the hot air. The verdure is thick and lush. Only a little white light ekes through from above, playing shadow games with the Spanish moss, which hangs lazily from branches like a woman’s hair. There are things that chirp and groan in the brush, hidden always from view. Even the water, completely covered in algae, provides countless hiding places for those things that chirp and groan. Or, more startlingly, the things that silently lurk. And I’m not just talking about gators. The early French settlers here told stories of the Rougarou, a creature that takes the form of a man by day but, by night, peels back its skin and turns into a hairy, ravenous beast that roams the swamp looking for prey. A French swamp werewolf, if you will. Laugh all you want, but I guarantee you wouldn’t be so smug if you were alone at night in the Barataria Preserve and you heard a rustle in the bushes. I was there at two in the afternoon with the eight other Bookpackers, when something scampered across my foot. I almost hit the deck. It was a 4-inch-long lizard, in case you were wondering. The Rougarou, alligators, and 4-inch-long lizards had certainly made me jumpy, but it was more than that. I had begun reading Interview with the Vampire. I could so clearly visualize Louis and Lestat, our two beautiful and blood-thirsty protagonists, hunting runaway slaves here. If the lights and licentiousness of New Orleans provide the place where Louis and Lestat can be elegant, well-dressed Creoles, the dark primitiveness of the swamp provides the place where they can be true beasts of the night. Though, I don't think Louis would care much for that description. Much like our vampire friends, our journey is far from over here in the cypress swamp. I hear a solo trumpet player in the distance, singing out, staccato and effervescent and joyous. Purple, green, and gold beads drip from tree branches and street lamps. At long last, New Orleans. There was only one thing that could free me from my swamp jitters. What better first "Meal of the Moment" than gumbo? We stopped at Boutte’s Bayou Restaurant in Lafitte (by the way, if you don’t know who Jean Lafitte is, you should look him up and possibly write to Steven Spielberg or Ridley Scott. I have no idea why they haven’t made that movie yet). Anyway, GUMBO. Gumbo, for those of you unaware of its sensational charms, is a stew, born right here in southern Louisiana a couple centuries ago. There are several different varieties, and I would never claim to understand what constitutes the perfect gumbo, but the one I had at Boutte’s was pretty damn good. 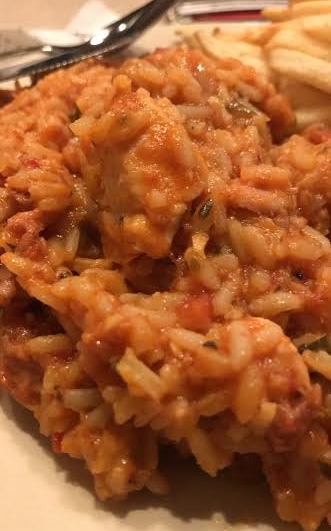 It was of the Cajun variety, containing chicken, shellfish (including, of course, crawfish and shrimp), andouille sausage, rice, and various veggies. I had it with buttered French bread. Don’t tell New England clam chowder I cheated on it. But is it really cheating if we were on a break? Gumbo is the official dish of Louisiana for a reason. The very creation of the stew represents the mingling of traditions that have come to define the state and, in particular, New Orleans. Gumbo is influenced by Spanish, West African, and French culinary practices, just as the city is influenced by these very same cultures. As we head into New Orleans, the concept of "Frenchness" will become vital, not only in contextualizing Interview with the Vampire (as well as The Awakening), but in understanding each sight, sound, and smell of the Big Easy. I had never heard of Grand Isle before my travels as a Bookpacker began. Upon first hearing the name a few weeks ago, I gave it a Google and found pictures of wide, flat beaches, porches of distressed wood, and piers jutting out to kiss the sunset. Oh, okay, I thought. This must be the Nantucket of Louisiana. Evidence of my Massachusetts-based worldview, to be sure. Just as Nantucket acts as a summer getaway for (oftentimes) the wealthy of New England, Grand Isle served the same purpose for the New Orleans elite around the turn of the century. Both islands have unique and intriguing histories. But the comparisons between the two, I quickly learned, stop there. We got settled in at Sol et Terre, our seaside home for the three days spent at Grand Isle. We then enjoyed our first Louisiana meal at Jo-Bob’s Gas & Grill across the street (I had chicken tenders because I was too afraid of gas station gumbo) and befriended the convenience store cat, Jo-Bob. Whether the cat came before the grill, or the grill came before the cat, I shall never know. But Jo-Bob was a delightful cat, and I hope he remembers our brief romance as fondly as I will. Unlike Nantucket or any other vacation spot with which I’m familiar, Grand Isle is quiet, seemingly devoid of tourists. The air is so saturated with moisture that a slight breeze conjures droplets indiscriminately. The thick-as-molasses atmosphere yields a small population of locals who move just like that – molasses. They're in no hurry. Oh, and they're super nice. After our group dinner at Yum's Restaurant, a few of us had the good fortune of meeting a lovely couple from the Baton Rouge area. They grow sugarcane and raise crawfish. Much like beaming parents, they pulled out their phones and began scrolling through photos upon photos of their critters, speaking in that round, rich Louisiana accent. Some of the most genuine people I've ever met. And yes, I do plan on heading up to their sugarcane farm at some point, just as soon as I find out what exactly sugarcane is. It's been explained to me so many times, it really has, but I'm going to need some pictures/diagrams/a short YouTube video. But let's get to the heart of our purpose here. From the moment we set foot on the island, a certain novella was burning a hole in my bag. Upon opening the book, I saw the world through the eyes of Edna Pontellier. I woke up that first morning and took my copy of Kate Chopin’s The Awakening – the first of eight books to digest during this trip – down to the beach. In the two days that followed, something strange and wonderful happened. It is a sensation I can only describe as “good eerie.” There is a quote from the book which has already been cited in the blogs of my friends: “The voice of the sea is seductive; never ceasing, whispering, clamoring, murmuring, inviting the soul to wander for a spell in abysses of solitude; to lose itself in mazes of inward contemplation.” I have lived by the sea all my life. I have heard its seductive voice before. But somehow, there on that beach, with the bath-like warmth of the Gulf licking my toes, I felt surrounded by ghosts. So I, too, stepped into the the Gulf. I lifted my pant legs (they got soaked anyway) and walked all the way out to the cluster of rocks about 30 yards from shore. I sat there and listened to the waves crash, watched a pod of dolphins follow a fishing boat out to sea, felt the sun and the heavy air and the salt of it all wash over me. That was my first encounter with the good eeriness –- a sensation I know will become a recurring theme in my Bookpacking experience. Everything was exactly as Chopin, writing over a century ago, had described. The Gulf was just as Edna had left it. But much, of course, has changed. I am a liberated woman. Edna Pontellier and even Kate Chopin, herself, were not. So as the sun set on my time at Grand Isle, I closed my eyes on the dying day by the ocean. For one extraordinary moment, I felt tethered to the generations of women who maybe came to Grand Isle long ago, as Edna did, seeking some semblance of freedom. It made me melancholic, for sure. But I was glad of the ghosts’ company. Oh, the drama! Oh, the supernaturality! Oh, the crawfish! Mon dieu. Next stop is the bayou, my friends, so buckle your seat belts. We'll be encountering some *gasp* whiny, Creole vampires with too much time and money on their hands. Also food. There will be food. Before I begin delving into my experiences with the literature, culture, food, food, and food of Louisiana, I want to take a moment to talk about Bookpacking and what it means to me (and I think...hope...our fearless leader, Andrew, agrees). I was first struck with the power of setting in literature when I was 13 years old, opening up Wuthering Heights for the first time. The novel intrigued me. It overcame me. It scared the daylights out of me. I have since read Emily Bronte's enduring story of destructive love on the desolate and beautiful moors of northern England a dozen times, and each time I learn something new. However, what never changes in my digestion of Wuthering Heights is the profound effect the moors themselves have on the story and its characters. Wuthering Heights is a study in how the powerful evocation of a particular setting can turn it into another character. Since first reading that novel, I have been (quite frankly) obsessed with immersing myself in and trying to understand the impact of setting in every work I read. Mid-20th century Southern California in Mildred Pierce, pre-revolution Russia in Anna Karenina, New York during the Roaring '20's in The Great Gatsby, Ireland prior to the War of Independence in Dubliners, and the list goes on. Because I so appreciate how setting informs a story, my own creative writing is, for the most part, heavily steeped in the culture of New England. Being from just outside Boston, I understand the character of this particular region of the country and use this knowledge to create stories I view as time capsules of a place and time – my place and time. For me, the opportunity to be a "Bookpacker" epitomizes one of the things I love most about literature – to immerse oneself in the culture of a setting with which one might not be familiar. I had never been to southern Louisiana prior to this trip, but I already feel as though I am getting a glimpse into the world of Edna Pontellier, Lestat de Lioncourt, and Ignatius J. Reilly (to name a few) in a way few other people do. Who better to teach me about the uniqueness of New Orleans than these characters and the authors who created them? That's me and Sarah. Sarah's nice. And cool. And Scottish. So many people nowadays would have us believe that fiction doesn’t matter. It’s frivolous and it won’t cure cancer. Yes, it’s true you won’t find the cure for cancer within the pages of A Confederacy of Dunces. But what you will find is the key to unlocking something we, as human beings, strive and struggle for every day – understanding. Peoples, cultures, nations impose narratives on other peoples, cultures, nations and, too often, the truth of identity gets lost along the way. But the narratives about ourselves, provided by we, ourselves – that’s where truth lives. Who are we, if not the stories we tell? If everyone travelled with a book in their hand – a true book that speaks with the voice of a place and a people – then I think we’d all be much better at the art of understanding. So…yeah. That’s what Bookpacking means to me. Hope y’all like my blog!